I received a nice box via FedEX yesterday. 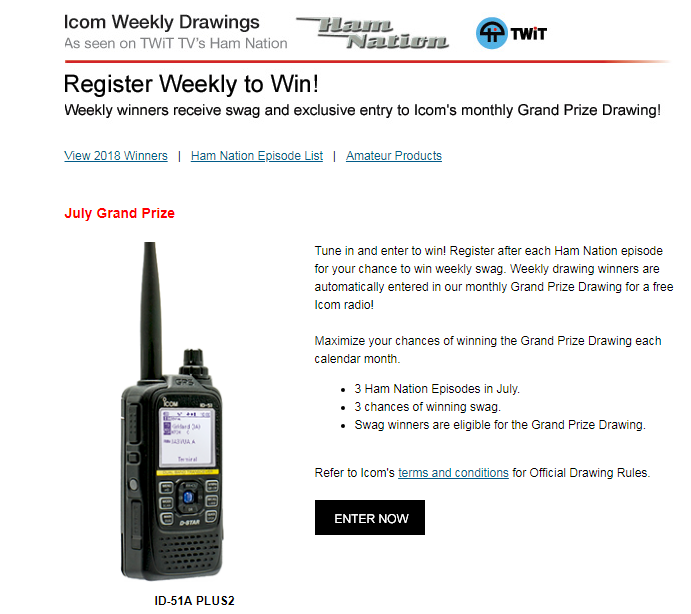 Earlier this month, I won a weekly random drawing in the Icom HamNation Weekly Swag contest. The box contained an Icom ball cap, Icom T-shirt, bumper sticker, map, chapstick with the Icom logo, an Icom neck lanyard, a nice Icom Luggage/Equipment tag, a pen, a couple of fake tattoos, lots of equipment brochures, and probably some other things that have slipped out of my feeble mind. Nothing of great value or consequence, but really appreciated and enjoyed! Thank you, Icom! The swag all goes well with and compliments my IC-7300! The procedure is simple … watch HamNation (on YouTube), and then fill out your info and answer a few survey questions (see the link in the first paragraph). You have a chance to win a weekly prize or a Grand Prize monthly. Nothing ventured … nothing gained, right? I worked a bunch of stations on 17, 60, and 80 meters yesterday evening. I was hearing good signals on all the hf bands except 10 meters. Truthfully, you can make FT8 contacts just about anytime on SOME band.